Cellana strives to produce ideal strains of microalgae that will satisfy rapidly growing market demands for aquaculture feed for use in fisheries and bivalve farms. 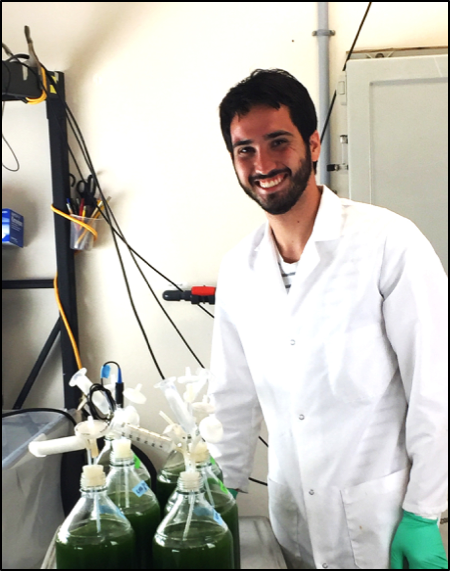 By harnessing cheap saltwater available at the Natural Energy Laboratory of Hawaii Authority, Cellana is exploring the potential of various saltwater microalgae strains for aquaculture production. This project redefines the scope to six uncharacterized microalgae strains: two Tetraselmis, Chaetoceros, and Haptophyte strains. Each strain was chosen to target a specific market within the aquaculture industry – Tetraselmis, for example, was selected for its use in conjunction with Nannochloropsis as a feed for rotifers as well as a standard feed for bivalve mollusks. Beginning with isolated cultures, each strain was grown over the course of eight weeks to two 20-liter carboys and one 2-liter flask. The 2-liter flask was harvested to produce a mathematical relationship between dry weight and optical density, allowing for the determination of algae mass using a spectrophotometer. A 20-liter carboy was harvested for freeze drying to be sent to labs for lipid analysis and the remaining carboy was inoculated into a 200-liter production bag in an outside environment to test for the individual strain’s resistance to the West Hawaii climate. During the growth process, growth rates and cell counts were recorded for use in determining the productivity of each microalgae strain. The final characterizations of each strain will then be compiled to determine their respective viabilities for production within the aquaculture industry, possibly influencing Cellana’s production line strains.